Ammanford is a small town that has a good selection of shops and has excellent transportation links. We have a single hall that can be used seated or unseated. Our seating capacity is 100. We charge £7 per hour, although daily rates can be discussed. We have a fully functioning PA system with small lighting rig and digital projection. The hall is well heated. There are facilities to make hot drinks. From Carmarthen head south east on the A48 towards Cross Hands. Keep on the A48 after passing Cross Hands until you get to the Pontabraham services where you will need to join the A483 and head north east towards ammanford. The hall is situated between the 2 sets of traffic lights in the centre of Ammanford. From Llanelli head north-east out of town following the signs for the M4. Join the M4 and head north towards the Pontabraham services. When you get to the services you will need to join the A483 and head north east towards Ammanford. 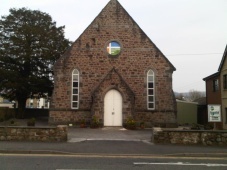 The hall is situated between the 2 sets of traffic lights in the centre of Ammanford.